It was the summer after my junior year of seminary, and I was burnt out . I wasn't just tired. There was an emptiness. Not just physical fatigue but spiritual emptiness. God felt distant, I felt emotionally numb. It's not that I didn't believe, its just that I was confused about what believing meant for me in that season. It was disorienting, I felt alone, and it weighed on me. My thoughts were consumed with the questions, "How did I get here? How did I come to inhabit such a state?...How did I burn out?" For me, and for Parker Palmer, burnout was a result of offering something I did not possess. Parker Palmer says what's behind this cycle that leads to burnout is what he calls, "the myth of the limitless self." We grow up hearing we can be whatever we want to be, and we can do anything we set our minds to. Pretty soon those "can" statements may turn into "should" statements, and all of the sudden there is a mountain of expectations weighing down on our shoulders. We attempt to fulfill the demands of the myth of the limitless self, and the consequence is "offering what we do not possess"; the eventual result is burnout. However, our true identity is not found in meeting others' expectations, or even meeting the expectations we believe God has for us. Our identity comes from God. Simply from being created in Gods image and being in God's family. How do we combat the myth of the limitless self? How do we avoid burnout? 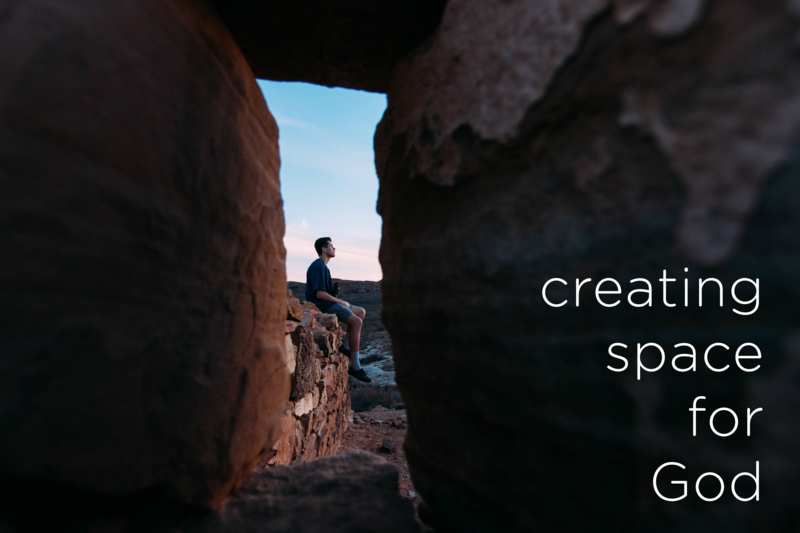 In a phrase: create space for God. The truth is, God doesn't ask us to achieve an identity through obedience or meeting expectations. He gives us an identity, a relationship of trust, that bears fruit. We cultivate this relationship by creating space to encounter God. Throughout scripture we see examples of how people create space to be transformed by God, and resist the temptation of the myth of the limitless self. Here are 3 examples of how we can create space for God: stopping, solitude, and silence. Stopping was built into what it means to be human from the very beginning. In Genesis, God rests on the 7th day from all his work. When God is leading his people in the Old Testament He instructs them on the importance of stopping. The Hebrew word for Sabbath literally means "stop." When we choose to create a time in our week to stop, we are actively resisting the myth of the limitless self. God gave us a gift when he showed us the practice of Sabbath. In a way God was, and still is, saying to us, "your life is not about what you achieve; it's not about what you do it's about who you are". Sabbath, or stopping, is about creating space to just 'be' with God and with others. Find a day or half-day in your week that you can designate for a non-work, non-obligation time. Consistency is helpful but not necessary. This isn't a time to do nothing, rather its a time to do the things that make you come alive. It's a day free of expectation. A day to delight in all that God has made and given to us. A day to delight in Him. Tip: Turn off your phone (or at least turn it on 'do not disturb'). Actively shut out the connections to the world of expectations that will be waiting for you the next day. The reality of our lives is hard to escape in solitude. Solitude is the environment where we sit with what is most true in our lives; the good, the bad and the ugly. But we don't sit alone. In solitude, we let God into our deepest selves, and listen. When we practice solitude, we are refined. We create space for God to speak truth into our lives. Something to try: Go for a walk around your block this week. Pray to God before you start: "God I'm giving this time to you, give me ears to hear what you're saying to me." Resource suggestion: The Urban Retreat in Shoreview, directed by Christine Osgood, is an invaluable resource here in the Minneapolis area. The Urban Retreat has both a group experience and a space you can reserve for a morning or afternoon of guided solitude. Silence and solitude are close partners in creating space to be with God. Though solitude does not always include silence, and you don't have to be in solitude to practice silence, they often come as a pair. Jesus clearly had a practice of both (eg: Mark 1:35, Luke 5:16). He does so because the Father clearly desires the peace of silence to be a context for communication. A classic example of this desire of God is His interaction with Elijah in 1 King 19:10-18 where God spoke to Elijah not in fire, earthquake, or wind (the noise of our life,) but in a gentle whisper. This is the God who says, "Be still and know I am God (Psalm 46:10)." Silence is a practice of stillness, a posture of listening for God our Father's gentle voice. Focus on your breathing. Some people focus on breath to symbolize breathing in God's grace and breathing out distraction. Journal. Write what comes to mind. Repeat a phrase like, "Lord your love is strong", "God have mercy"or "God you are good." Something to try: This week at work take 5 minutes of your lunch break and go somewhere quiet (empty office, break room, outside somewhere). Take two minutes and try to be silent before God. Start with a prayer, "God I'm here to be in your presence. Speak to me what you want to, I am listening." Resource suggestion: Mill City Training Podcast - The Spiritual Weight of Expectations with special guest John Nielsen. Last week I had the privilege of sitting down with John to talk about this topic and he shared some really wonderful and practical tools for practicing silence. I encourage you to check it out. The point of all this is not to create more expectations that we feel we have to meet in order to please God. These practices are gifts, gifts God has given His family to connect with Him. May you experience the joy that was intended to be experienced in these practices as you create space for God in your life. Listen to our current series, Searching for God, to learn more about creating space for God.